Today, a Dominick's grocery store stands on this corner—while practical, it's far less glamorous than the Edgewater Beach Hotel that once graced this stretch of Sheridan Road. It was the go-to place for the rich and famous, and among its guests were Marilyn Monroe, Frank Sinatra, Judy Garland, Charlie Chaplin, Bette Davis, Tallulah Bankhead, Nat King Cole, and U.S. Presidents Franklin D. Roosevelt and Dwight D. Eisenhower. There was even a seaplane service that could take you downtown, in case you didn't want to mix with the peasants and drive the few miles. The hotel closed in 1967, just a couple of years before I was born, but I always feel an intense wave of nostalgia when I look at photos of it. 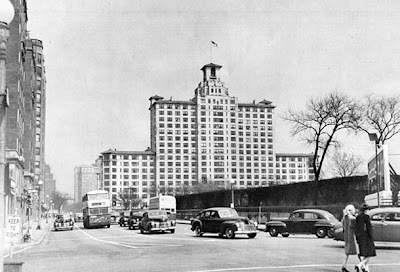 How pretty it must have looked, painted a soft butter yellow to represent dawn, just as the accompanying Edgewater Beach Apartments, which still exist at Sheridan at Bryn Mawr, were painted a pale pink to represent sunset. I watched them tear her down and played in the rubble when I was a boy. My grandfather Jean Anthony Greif was an organist at The Edge Water Hotel. Also performed at Marbro Theatre.